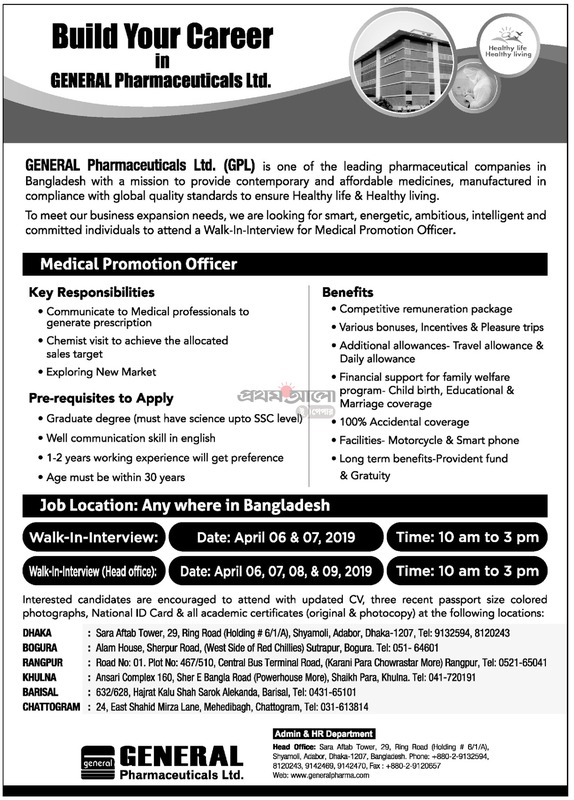 General Pharmaceuticals LTD GPL Job Circular 2019 has been published. General Pharmaceutical job resignation are many category. It’s an huge opportunity to unemployed people,Who want to do in this sector. General Pharmaceutical is the most valuable part in our country. This is the most popular pharmaceuticals company in Bangladesh. With the job chances in General Pharmaceutical Job Circular 2019,anyone can take this opportunity. General Pharmaceutical offer to people for exciting career opportunities in pharma sector. General Pharmaceutical think that young and energetic people is the key to success in this sector that create brightness in our country. Otherwise, General Pharmaceutical help’s us to social economy. If you want to apply for this job,you should submit your application within short time. Ssc pass a kono Pharmaceutical a job pawa jabe please janaben?? diploma in pharmacy 5ht semister running amar jonno kono job ache ki ? আমি মাষ্টার্স পাশ । আমার সকল সার্টিফিকেট মানবিক বিভাগ থেকে।আমি কি চাকুরী পাব?